A wide array of diamond tooling available for diamond grinders allow these machines to be versatile in removing the different types of coatings, mastic’s and adhesives. Capable of both heavy coatings removal and high-polishing, at Aardvark Painting Inc. we’ve found that most use of these machines falls somewhere in between. For surface preparation, diamond grinding is superior to shot blasting for thin finishes like thin-mil epoxy and urethane coatings and cement micro-topping. Often times the existing substrate conditions prevent even the most experienced operator of shot blasting equipment from leaving a striped patterned effect typical of the shot blasting process; a pattern that may easily transfer through the thin finish and create a permanent undesirable effect. Diamond grinding allows for more control over the ultimate surface profile. 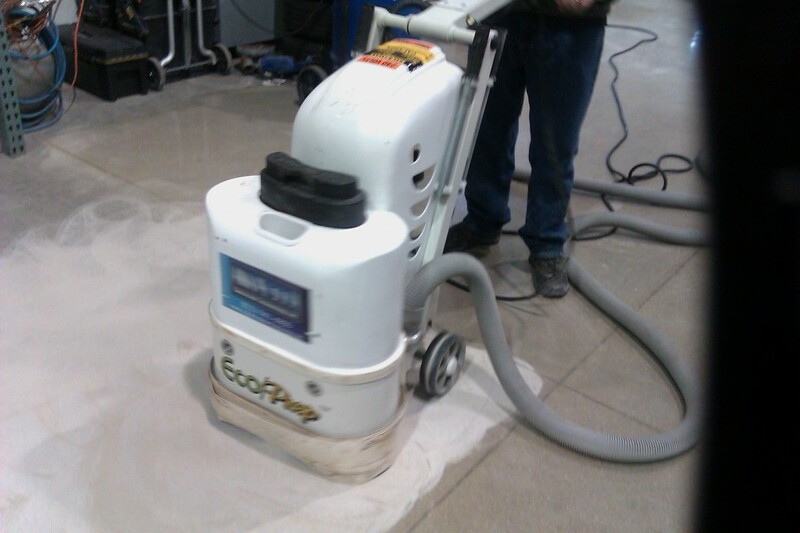 Diamond grinding is also a cost effective method for functional concrete restoration and implementing sustainable floor finishes. For less money than polished concrete flooring, concrete can be ground only once or twice over to clean the surface and make it more flat and level; leaving a honed finish. Combine grinding with crack filling and other superficial repairs to provide a functional surface ready to be clear sealed with epoxy, urethane, acrylic, or a concrete hardener /densifier. Decorative concrete stain or dye, if desired, may be applied prior to sealers. Diamond grinders require either 240 or 480 volt, 3-phase electricity, varying by size of machine, which we’re able to provide with our generators.